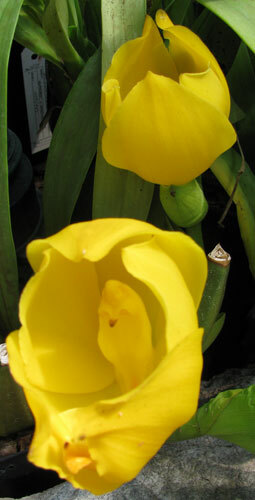 Anguloas, also called Tulip Orchids, are relatives of the Lycaste orchid genus. They are found in South American rainforests. The flowers have good substance, and they are fragrant orchids, typically smelling of cinnamon. Colors are geen, white, yellow, and red. The flowers are round and curved inward, giving them a resemblance to tulips. There's one flower per spike, but you often get many flower stems. They have large, thick pseudobulbs, with long, thin, veined leaves. They like intermediate to high light, 1500 to 4000 footcandles. It varies a bit with species. Give as much light as you can without sunburn. Temperatures should be cool to intermediate. 65-75°F (18-24C) during the day works well for most species, with a 10-15°F drop at night (6-8C). During the growing season, water as they approach dryness; don't let them dry out. Some species will drop their leaves after flowering; these need a dry rest after blooming, so let them dry out, watering just enough to keep the pseudobulbs from shriveling, until they start to grow again. Fertilizer is more important during the growing season. They like a lot of humidity; 70-80% is ideal. Many people who grow them in greenhouses or orchidariums let things get really misty, up to 100% humidity, a couple times a day, controlled by a timer. This can also help lower the temperature. Humidity can be less during a dry rest. Most of these species are terrestrial orchids and appreciate a finer potting mix. A mix of sphagnum moss and fine-grade fir bark or perlite works well. Hybrids with Lycaste are called Angulocaste.